Stopping off for caffeine hit in Sydney's Newtown, I stumbled into a kitsch little world of craft and coffee. A Coffee and A Yarn is about sitting, knitting and sipping. The place is a treasure chest. 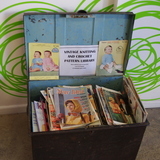 Actually there also is a treasure chest of antique knitting magazines and patterns from the 1950s and 1960s on the floor near the door as you come in. There is a wall full of colourful wool. It's also about a good yarn. There is yarn available to buy- all local sourced and with ethical arts in mind. There are some truly groovy retro colours as well as some nice earthly colours. In fact, you knit it, they got it. The place is run by some young conscientious retro Newtown sorts, but as I sit with my cappuccino unwinding, the old lady in the corner, knitting like the devil, gives me a wink. As well as coffee they serve organic teas and little treats. Crochters (and other artisans) welcome too. When: 10am- 6pm Mon to Friday, 9am-5pm Sat., 11am-5pm Sun.